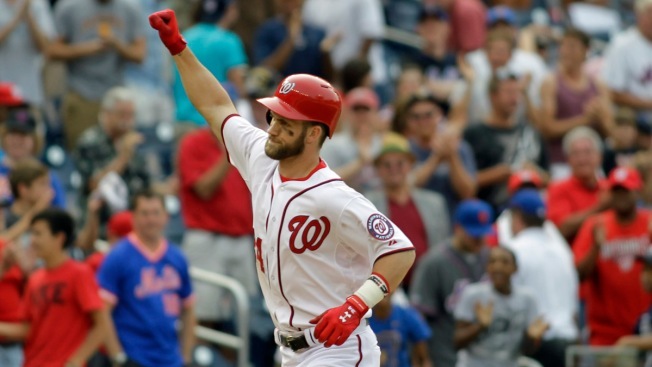 Washington Nationals outfielder Bryce Harper was named the National League's Most Valuable Player as expected Thursday. Harper, the favorite to win the award, was a unanimous selection, receiving all 30 first place votes from members of the Baseball Writers' Association of America. He became the youngest unanimous MVP winner in baseball history. Harper turned 23 last month, after the regular season ended. The 2012 NL Rookie of the Year led the majors in slugging percentage and on-base average. He hit .330 with 42 home runs and 99 RBIs. Harper is the first player from a Washington franchise to win an MVP -- no one on the original or expansion Senators or Nats had done it -- and he is the fourth-youngest player overall to win an MVP, with Stan Musial, Johnny Bench and Vida Blue also 22 but not quite as old. This year, Harper reported to spring training with one goal -- the only number he focused on was games played. Harper finished with a .649 slugging percentage and a .460 on-base average. He went into the final day of the regular season with a chance to win the NL batting title -- Miami's Dee Gordon edged him -- and scored a league-leading 118 runs. "Every team that we played circled his name and said, 'This guy's not going to beat us.' And with that said, he beat a lot of teams. So it was a remarkable season. As we said at this time last year, I thought that `Harp' was just scratching the surface of what he can be." Arizona first baseman Paul Goldschmidt finished second in the voting, and Cincinnati first baseman Joey Votto finished third.